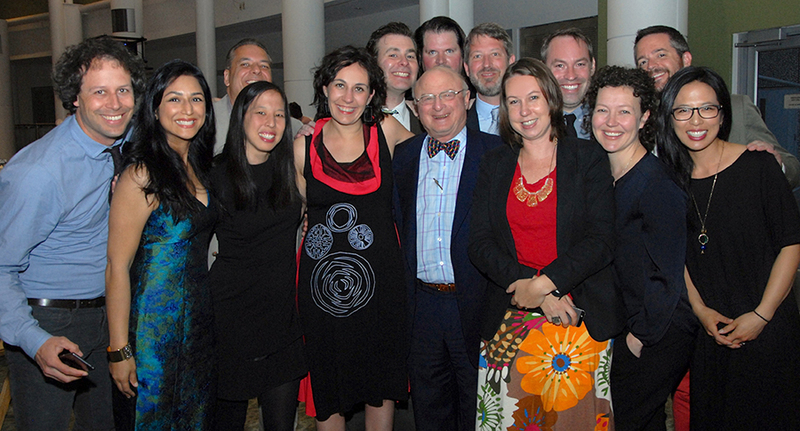 Knight-Wallace alumni, university colleagues and journalism luminaries honor Charles R. Eisendrath’s legacy to journalism. In a massive events space on University of Michigan’s North Campus elegantly arrayed with energetic servers buzzing around, Dave Farrell ’93 offered up a worthwhile reminder of how far the Knight-Wallace Fellowships have come. 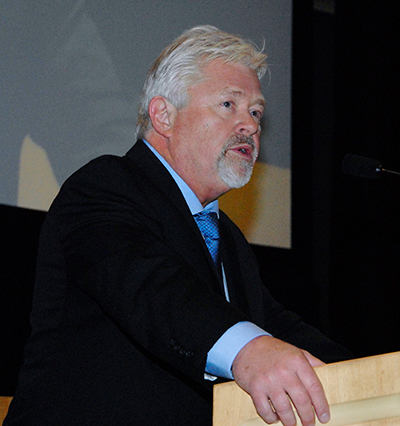 Today, of course, the program is renowned for its international travel to South America and Turkey, so Farrell wanted to explain to the 400 attendees at an April 15 fête for retiring Director Charles Eisendrath his role in how those exotic trips became a part of the deal. “Farrell,” Eisendrath told the then-Detroit News staffer, “go down to the university transit hut and sign out the biggest van you can find.” He did as he was told, returning to the newly acquired Wallace House with a cargo vehicle. A little later, Farrell drove the van “with fellows stuffed in the back” to Detroit. “Our destination was to find a guy who nailed a hubcap to a tree and called it art,” Farrell told the audience. From such humble beginnings, the program swelled along with the prestige of the Livingston Awards, and Eisendrath became an icon of journalism. No explanation was necessary, for example, for the cakes perched as each table’s centerpiece coated in white fondant frosting and bedecked by a candy bowtie. 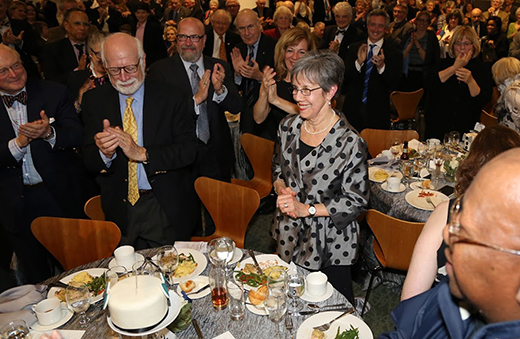 Over dinner, university administrators and faculty, former Fellows and other colleagues stretching all the way back to 1970s reminisced and honored the larger-than-life human nucleus of two of the profession’s most important programs. Eisendrath, who came to University of Michigan from his job as a foreign correspondent for Time, would never leave. He taught journalism and took over as director of the school’s now-gone masters program in 1980. That year he also became founding director of the Livingstons. One of his students, commentator Jack Lessenberry of Michigan Public Radio, recalled Eisendrath’s teaching style – which felt familiar to anyone who had been a Fellow. “Charles gave us some simple instructions, threw us in the deep end and expected us to swim on our own,” said Lessenberry, head of journalism at Wayne State University. Will Potter, KWF ’16, spoke on behalf of the group – Eisendrath’s last crop – to explain how an Ann Arbor speakeasy called The Last Word would now offer an honorary drink, the “Thunderous Round,” which is made of Traverse City whiskey, cherry liqueur, agave syrup, bitters and “a splash of mediocre sherry.” Eisendrath’s evaluation of the seminar offering at Wallace House. Clemetson used the occasion to announce that the Knight Foundation was pledging $50,000 towards an annual symposium on international journalism at the University in honor of Eisendrath’s keenest interest. “To listen to all you’ve created, to be the beneficiary of what you’ve created and know it has strengthened me and my career and enabled things I did after the fellowship … to be able to come back is the greatest honor for the greatest man who has done so much for me,” she said to close out the night. Over 200 Knight-Wallace alumni came from far and near to celebrate with Eisendrath, including many from the class of 2011-2012.